Purpose: First and foremost, to disciple and develop students while also providing much-needed space for other CCC ministries. 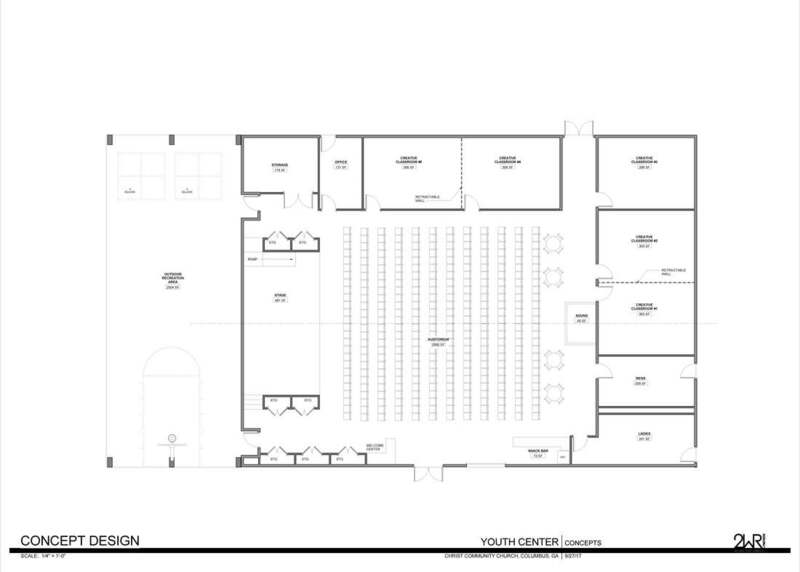 350- to 400-seat auditorium/large group meeting space. At least 5 classrooms, 4 of which will be separated by a portable wall, meaning these 4 rooms can become 2 larger rooms. • A stage and AV booth. A snack bar with warming kitchen. An outdoor (covered) area for gatherings or recreation. ​Why would we spend so much money on a building when there are so many needs in the world? CCC has never been a building-centric church. In 20 years, we have built only one facility. We also take missions very seriously, generally giving more than 25 percent of our income to missions and releasing many of our most gifted leaders to ministries outside our walls. For those reasons, we have been very slow to invest in buildings. At the same time, we recognize that buildings are a necessary tool in the fulfillment of our mission to make and equip disciples who will have Kingdom impact in the world. We believe the cost of this building will be returned many times in the form of fruit for the Kingdom of God. It is also important to remember that CCC gives a tithe (10 percent) of all income to missions, including gifts given for buildings. If we raise the $1.2 million in gifts, that means we will be giving $120,000 to missions. Why can’t the students continue to meet in existing facilities? They can and are, but our student ministry is quickly outgrowing our current facilities. Our vision is for a dynamic student ministry that is reaching and raising up hundreds of sold-out followers of Jesus. We don’t have facilities that can meet that need. Additionally, we have other ministries that would benefit significantly from another facility. From Celebrate Recovery to rooms for Sunday Morning Gatherings and events such as Leadership Community, Prayer Week and men’s and women’s ministry gatherings, we are challenged by the absence of a facility that would accommodate groups larger than 100 and smaller than 700. I just finished or am still fulfilling my pledge to the 50-50 Campaign. Are you really asking me to give again? If you participated in the 50-50 Campaign, you played a part in one of the most important journeys of faith we’ve ever taken as a church. Thank you, and please know that you’ve already helped meet this current need. We will be able to give substantially from savings because we are debt-free. If you are still fulfilling your 50-50 pledge, please continue to do that. If you have fulfilled that pledge and would like to continue giving by contributing to the Student Center, please complete a separate pledge card for the Student Center. If you have fulfilled your 50-50 pledge and God gives you peace that you have done enough, please know that we are grateful for all you have done and have no further expectations. What is sacrificial giving? When we say we are asking you to consider making a sacrificial giving, we mean two things: 1) It is a gift over and above any regular giving to fund our ministries. If everyone simply shifts their giving from ministry funding to the building, we will have the building but insufficient means to carry out our ministries. 2) It is a gift that is uncomfortable and faith-stretching. That’s why we never talk about specific amounts when it comes to sacrificial giving. What is sacrificial for one is not sacrificial for another. While the building is important to us, God’s agenda in such ventures is always greater than a building. God wants to teach us the power of a generous life, and that lesson is best learned when we are willing to give at levels that stretch our faith. ​Why do you want me to make a pledge? If we adopted the “build it and they will come” approach to buildings, we wouldn’t need pledges. Our aim, however, is to carry zero long-term debt on this project. To accomplish that aim, we need to know what you intend to give. e budget for this building will be directly determined by the amount of pledges plus any savings we commit to the project. Your pledge is not a legal contract, but it is important that you take your pledge seriously. Of course, if your nancial circumstances were to change, you would be free to adjust your pledge at any time. How do I make my pledge? Click here to download a pledge card or pick one up at CCC, available at the guest desk in the lobby and the reception desk in the Admin wing.